The exhibition on show at Rétromobile is all about Jacques Henri Lartigue’s passion for racing cars. He would point his lens wherever he felt like it… at the most varied range of subject matters. He photographed the 1905 Gordon Bennett Cup, the 1978 Monaco Grand Prix and the ACF Grand Prix of the golden age. He documented the 1912 Gaillon hill race, the opening of the Linas-Montlhery Aerodrome in 1924, the roaring 20s races in San Sebastian, La Baule and Cap d’Antibes and the 1967 Indianapolis 500 automobile race. He even photographed the filming of The Racers in 1954 and the 1966 Grand Prix in Monaco. For our delight, Lartigue immortalised vehicles built by Lorraine-Dietrich, Darracq, F.I.A.T, Schneider, Delage and Peugeot, as well as other Bugattis and Alfa Romeos, using his immense and unique talent to represent this "chic impression of speed". Jacques learned about photography through his father back in 1900. Seeing just how enthusiastic he was, Henri Lartigue gave his son his first camera when he was eight years old in 1902. From that moment on, he photographed his life as a child – car trips, family holidays and above all his elder brother's inventions. Both brothers were passionate about cars, aviation and all other types of sport which were booming at the time. Jacques documented them with his camera. As an adult, he continued to attend sports events and even indulged in a number of sports that were reserved for society's elite classes, such as skiing, skating, tennis and golf. However, for this child who was so desperate to capture time as it passed, photography was not enough. The problem was, how could he contain everything and say everything that he wanted to say in an image that was taken in just a few seconds? At the same time – probably because he wanted to be involved in a recognised activity – he started to draw and paint. Until the start of the 1930s, he enjoyed a luxurious, sophisticated life. But the Lartigues’ fortune dried up and Jacques had to find other sources of income. Refusing to work for a living for fear of losing his freedom, he lived frugally from his painting throughout the 30s and 40s. Then in the 1950s – and contrary to the legend which suggested that he was a complete unknown – Lartigue started to work as a photographer, while continuing to paint. In 1962, Jacques set sail for Los Angeles with Florette, his third wife. Before arriving, they made a little detour via the East Coast and met Charles Rado of the Rapho agency who introduced Lartigue to John Szarkowski, the young curator of the Museum of Modern Art’s photography section. The meeting generated a great deal of enthusiasm. In 1975, a first retrospective of his work was shown at the Museum of Decorative Arts in Paris. The year before that, Lartigue had been commissioned by the newly-elected President of France – Valéry Giscard d’Estaing – to shoot his official portrait. In 1979, a deed of gift was signed: Lartigue became the first French photographer to donate his life's work to the French state while he was still alive. He entrusted the Association des Amis de Jacques Henri Lartigue with the task of preserving and promoting his work. In 1980, his exhibition "Bonjour Monsieur Lartigue” was shown at the Grand Palais in Paris, evidence of Lartigue’s desire to see his own "museum" opened. He continued taking photographs, painting and writing right up until his death. He died in Nice on 11 September 1986 at the age of 92, leaving behind more than 100,000 photographs, 7000 diary pages and 1500 paintings. 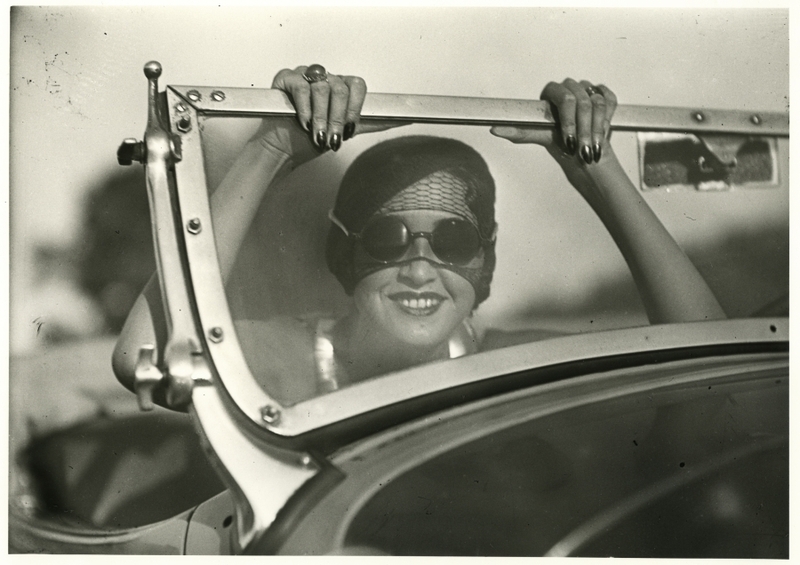 It's impossible to think about Lartigue’s photographs without remembering his "deformed cars", as certain people liked to call them. 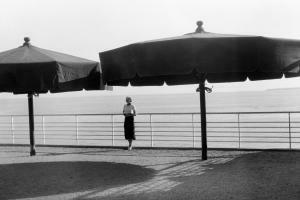 This is evidence of the fact that this particular image has almost become a sort of "logo" representing Lartigue’s work. It encapsulates a number of the qualities that are inherent to his photographs: movement, dynamism, modernity and beauty. Very early on, Jacques was introduced to car racing by his father and his older brother Zissou and developed a passion for it. In 1905, the whole family travelled to the Auvergne region in central France to watch his first race – the Gordon Bennett Cup. From that moment on, the young Jacques started taking pictures of moving cars and drew numerous models or photographs that he had taken during the day. Little by little, his gaze became hardened and as camera technology continued to evolve, he obtained images that were of a surprisingly high level of realism for the time. 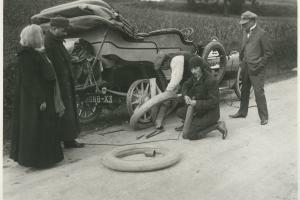 In 1912, while he was in Le Tréport, he wrote in his diary about how he got his shots: "The first car arrives over there! First there's a curve, then the straight line… it passes right in front of us at high speed – it's fantastic! The second one arrives. It’s Boillot in a Peugeot. I shoot it at high speed (180 km an hour), pivoting slightly so I keep it in my viewfinder as it passes. I've never done that before! I'm taking photographs. Yves (the driver) appears on the list. Mrs Folletête gives the time and Mr Folletête (her instructor) gives the number. So well that we follow the race in every detail." 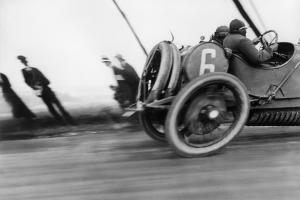 In his book “Lartigue et les autos de course”, Pierre Darmendrail explains the specific details of the image: “Not only did Lartigue use an innovative technique for his photography… he took it to extremes by setting himself up right on the edge of the road, where cars would pass right by him at 140 km/h or faster. He would seek out the sensation of speed, letting it enter his very heart, slipping into the ultra-rapid movement of his subject – hence all the dynamism and power that this photo has". One question remains: a question about the caption. Lartigue pasted the image into his 1912 album, titling it: Delage automobile, Automobile-Club de France Grand Prix, Le Tréport, 26 June 1912. But according to David E. Junker, the vehicle was a Théophile Schneider which was competing in the 1913 ACF Grand Prix. Could Lartigue have made a mistake? Was it intentional? 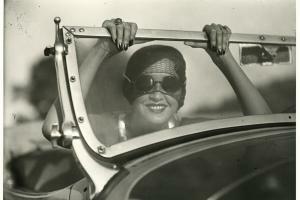 Nothing that Lartigue wrote sheds any light on this mystery.